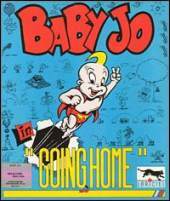 As the eponymous Baby Jo you're trying to make it back home. Can a simple baby get past the four levels while avoiding the bad-tempered animals and machines on the way? This is a side-scrolling platform game. Jo can pick up rattles which can be tossed at enemies (such as bees, lawnmowers or spiders). Apart from watching out for the baby's dropping health (represented as an increasingly tearful face), the baby's diaper gets wetter over time and the thirst increases, too. If the diaper becomes too wet or the baby becomes too thirsty, the player immediately loses a life, so collecting fresh bottles and diapers is important.